Flat roofs are very much in vogue. In recent decades, they have been used primarily for commercial buildings, but they are also finding more and more use in the construction of private homes. Flat roofs offer many advantages, but they also pose special demands on the installer and the required fasteners. 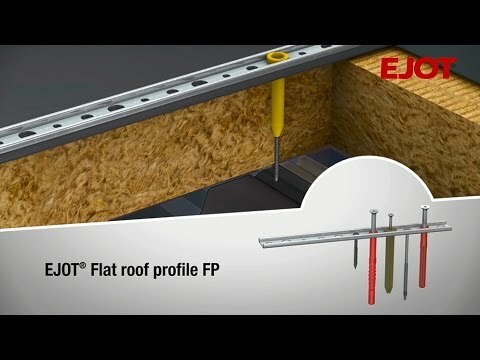 EJOT offers professional fasteners, and installation tools for the efficient attachment of insulation and waterproofing membrane to flat roofs and slightly sloping roofs. The EJOT Dabo self-drilling roof screws are the ideal fastening solution when it comes to securing insulation or securing roofing membranes to substructures made of sheet steel, aluminium sheet, wood or wood-based materials - regardless of whether it is a new building or a refurbishment. With the new metal rail fastening system for mechanical fixing of roofing membranes, almost all application cases are covered. The flexurally rigid metal section with alu-zinc coating features three different hole diameters. This results in many different fastening possibilities with self-drilling roof screws, classic self-drilling screws, frame anchors and in part also in combination with a special plastic tube washer to reduce thermal bridges. The EJOT metal profile fastening system is the only flat roof rail offering an approved solution for all applications on flat roofs according to ETA-07/0013 and for wall connections according to ETA-10/0305. When it comes to attaching insulation or roofing membranes to substructures made of concrete and aerated concrete, EJOT concrete and aerated concrete screws achieve the best results. Pull-out tests have to be arranged with our service team for all renovation cases. For special requirements of resistance to imposed loads, EJOT recommends tube washers in combination with EJOT Dabo© screws. The high-quality plastic also effectively reduces thermal bridges. The EJOT metal stress plates are the ideal supplement to securing insulation materials and roofing membranes on substructures made of wood, wood-based materials, concrete and aerated concrete in combination with the EJOT Dabo® roofing screws and concrete and aerated concrete screws. As a premium product, the flat roofing anchor is a specialist for attaching insulating materials and roofing membranes on solid building materials such as concrete and aerated concrete. The use of the EJOT flat roofing anchors is also recommended for slope insulation. The anchor sleeve made of high-quality plastic also effectively reduces thermal bridges and prevents screw head protrusion due to foot traffic.